When sending robots down a mine or other areas that are hard to navigate, researchers at EPFL's Laboratory of Intelligent Systems decided to take a page from nature and design a robot that doesn't just avoid danger but knows how to right itself when it crashes. "Here at EPFL systems we try to take inspiration from nature to build robots that are better adapted to navigate in the real world and not just the laboratory environment," said Adam Klaptocz, one of the researchers at École Polytechnique Fédérale de Lausanne. "It all started when we were looking at insects and how they fly, and even though they managed to avoid most obstacles they still managed to fly into windows and into walls and yet it is OK, they don't break. So we thought instead of making a robot that just avoids obstacles why don't we make a robot that can crash into things, fall to the ground and instead of breaking get back up again and keep on flying—something that no one has done up to now." 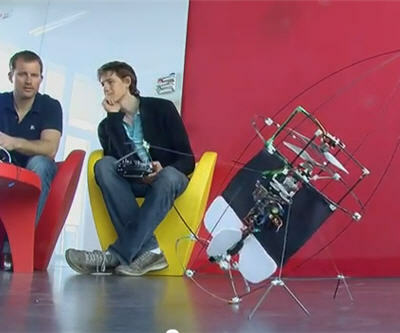 Klaptocz said his robots are designed to be softer and more compliant, like animals and the human body. Places where the flying robots may be more useful are industrial sites that may be dangerous and strewn with debris, like irradiated nuclear power plants, caves and mines that have collapsed. "Places where this is very little light, lots of obstacles where ground robots can't reach them either and where traditional flying robots that avoid obstacles but need very large spaces would not be able to navigate." EPFL is a technology institute located in Lausanne, Switzerland.